In a review for Hyperallergic, Alexis Clements explores “Twice Militant: Lorraine Hansberry’s Letters to The Ladder “ exhibit at the Brooklyn Museum. The small exhibition includes the letters Hansberry wrote in 1957 to The Ladder, the first subscription-based lesbian publication in the United States, published monthly from 1956-1970 by a lesbian civil rights group called the Daughters of Bilitis in San Francisco, an unpublished typewritten essay on “the homosexual question,” a poem titled “Le Masque,” a notebook with a drawn self-portrait, the full transcript and audio recording of a conversation between Hansberry and Studs Terkel about a range of topics as well as Hansberry’s handwritten lists to herself on her birthdays. Clements spends considerable time discussing Hansberry’s annual lists of likes, dislikes, hates, regrets; she says, in conclusion: What these lists show is that [Lorraine Hansberry] was human, imperfect, frequently deeply lonely, but brilliant and ever-searching. “Twice Militant: Lorraine Hansberry’s Letters to The Ladder” was exhibited in the Herstory Gallery of the Elizabeth A. Sackler Center for Feminist Art from November 22, 2013 through March 16, 2014. The Herstory Gallery is devoted to subjects that explore the significant contributions of the women named in The Dinner Party by Judy Chicago. The exhibit was organized by Catherine Morris, Sackler Family Curator for the Elizabeth A. Sackler Center for Feminist Art, Brooklyn Museum. 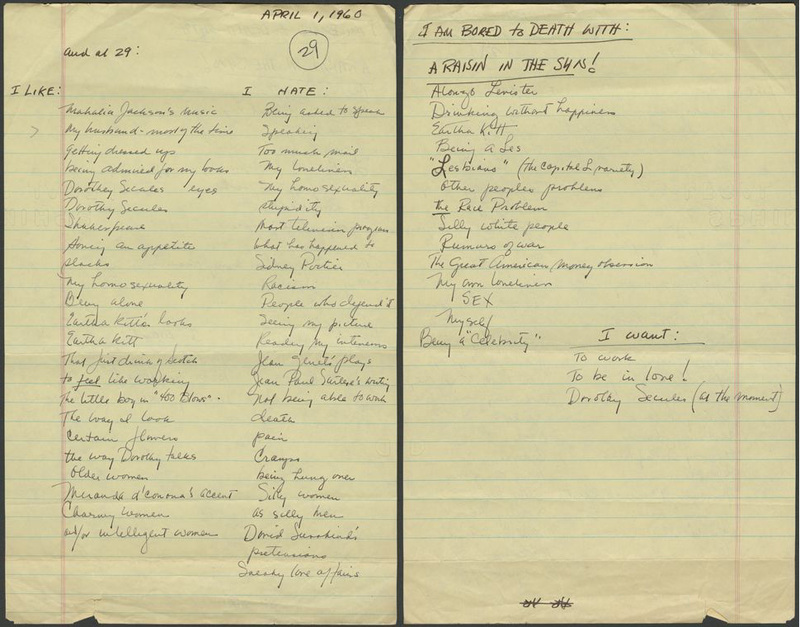 And at 29: notepaper with handwritten lists titled “I like” and “I hate” on front and “I am bored to death with” and “I want” on back, April 1, 1960. LHLT private collection.